Risk Profiles: Earthquakes - Business Insurance Associates Inc.
At 8:24 am on Friday, November 30th, a magnitude 7.0 earthquake struck southcentral Alaska and caused widespread property damage, but fortunately no loss of life. This powerful earthquake, centered 10 miles north of half of Alaska’s population in the city of Anchorage, was felt as far away as 400 miles, and registered on the seismic monitoring equipment of countless states in lower 48. In the immediate aftermath, residents have been besieged with over 1000 aftershocks, leaving an entire region on edge. For those who have never been through such an event, the fatigue of the unexpected puts tremendous strain on your body, mind and emotions. After going through a violent earthquake, every aftershock instantly brings feelings of a pending re-occurrence. Nearly everyone suffered property damage in some form, from structural building damage to personal belongings and business inventory spread across the floors, the damage would easily run into the millions. That doesn’t even include the widespread damage to infrastructure such as roads, bridges, and schools. There was no loss of life, which is a testament to both the building codes of the region and the people of the region who are accustomed on some levels to seismic activity, and have preparations in place for such events. For longtime Alaskans, the real traumatic part of the earthquake was knowing it could’ve been worse. 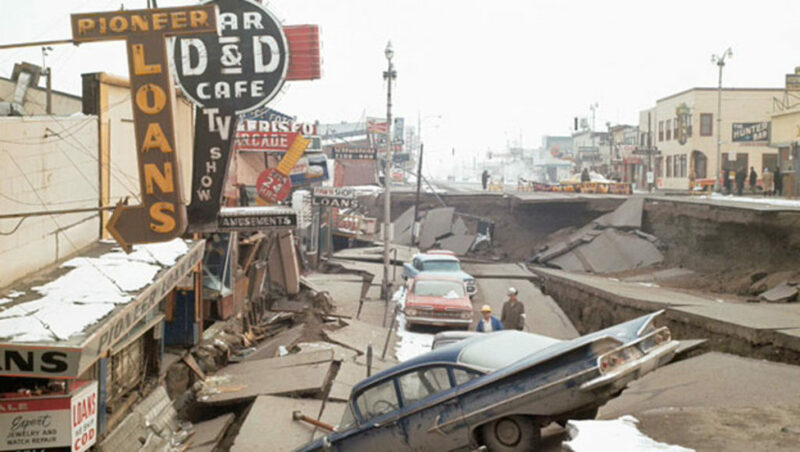 In terms of the violence unleashed, this was the strongest earthquake to rock Anchorage since the Good Friday earthquake of 1964, that unleashed geographic damage across the state when the largest earthquake in North American history registered 9.2 on the richter scale. To put things in perspective, the 9.2 earthquake that struck on March 27, 1964 was more then 1500 times more powerful then the earthquake that struck in November 2018. It’s that sobering reminder that sits heavy in the minds of Alaskans when we go through a terrifying 7.0 earthquake, you don’t know if this is a repeat. The size and scale of the destruction in the 1964 earthquake is misleading, if viewed in the context of loss of life and property. Certainly there was a tremendous amount of both, but at the time Alaska was still a young state, with younger infrastructure and a smaller population, so those figures tend to dwarf the actual magnitude and power of this earthquake. At 5:36 PM (AST) on Good Friday 1964, a 600 mile stretch of fault ruptured 75 miles east of Anchorage, unleashing the four and a half minute earthquake from 500 years of built up movement. The destruction unleashed tsunami’s, collapsed structures, destroyed roads, and caused permanent fissures in the ground around southcentral Alaska. Today you can still see the permanent effects on the landscape in Anchorage and through the Prince William sound region. The fact remains, that Alaskans live in a geographic region prone to seismic and volcanic activity. While you might have some coverage for volcano/lava related exposures (check your policy), earthquake coverage is not automatically included. In some cases, depending on who the insurance carrier writing the property coverage is, earthquake coverage can be endorsed to your current policy. In other cases, it might make sense to secure the coverage on a stand alone policy, or in combination of flood coverage, which is also not included on a standard property policy. That being said, earthquake coverage can be cost prohibitive for some property owners and have high deductibles, leaving the policy owner self insuring the smaller claims. The simple fact is, most property owners are more concerned with the building burning down, or being broken into and vandalized, then with it being destroyed in an earthquake. Certainly in the days after a major earthquake, that mindset may be a little different, but when you’ve gone 50+ years without a major destructive earthquake, people tend to opt to retain that risk rather then transfer it through an insurance policy. If you have suffered property damage in an earthquake, it’s important to conduct an inspection as soon as safe to do so. Do not enter any buildings that appear to have structural damage, conduct a visual inspection of the building, utilities and gas. If you smell gas, leave immediately and call 911. For any other emergencies contact 911. If you are able to safely do so, turn off the gas at the main. If conditions safely allow, try to protect any property from further damage from rain, snow, water, ice or wind. If you have earthquake insurance coverage, notify your insurance company. If you do not have earthquake coverage, then you must handle the subsequent clean up and protecting of the premise on your own. This might vary from doing minor cleanup on broken personal property, to having to arrange for structural engineers or utilities to perform inspections before it can be safely returned to. In the aftermath of such an event, you can count on these type of professionals to be in high demand and there may be delays in getting access to these essential services.